At first glance, the box we're examining is full of what appear to be relatively unimportant-looking dots on pins. We’re in the Field Museum’s insect room, which holds some 4 million bugs – an impressive number which actually amounts to only a third of the Field’s entire insect collection, the museum’s largest. Crystal Maier, the insects collection manager, leans over the box and pulls out a particular dot, which turns out not to be a dot at all, but a rove beetle, a type of insect found throughout the world, and of which the museum also has many. Because the Field has such massive collections, curators don’t always know exactly what they have, for many specimens are still in the process of being cataloged and imaged, a process which the museum has worked at since receiving a grant almost three years ago. This becomes especially apparent in the insect collection, where less than one percent of the 12 million specimens have been archived. For instance, until recently, when the beetles began to be individually imaged, no one had any idea that one particular rove beetle – the one Maier now holds in her hand – had originally been collected by the famous English naturalist Charles Darwin. Of course, Darwin didn’t personally hand over that rove beetle to the museum, as he died in 1882, some 10 years before construction first began on the Field. Instead, the museum acquired the beetle in 1951, after buying a collection from a man named Max Bernhauer, a German insect-collector who described over 5,000 species within his lifetime. Darwin had originally collected the beetle in Chile, potentially during an 1834 expedition to Chiloé Island, according to Maier. But naming a new species isn’t exactly a willy-nilly experience. Before naming his Darwin beetle, Bernhauer would have had to consult a big book called “The International Code of Zoological Nomenclature,” basically a how-to for describing new creatures on planet Earth. Bernhauer decided his “Darwin beetle” was a whole new species in 1935, ultimately naming it “Polylobus darwini.” Part of why the museum maintains the beetle has to do with the importance of keeping a record of the species. So that later, if someone else were to challenge Bernhauer's classification, they could examine the beetle themsleves and potentially make a different case, Maier says. Just beneath the beetle, which is barely bigger than a piece of lint, sit 10 or so equally small labels – each added at a different stage in the bug’s existence as a specimen. Several of those belong to the museum, one of which contains a barcode assigning the beetle a unique number that no other animal in the world has. Another is from Bernhauer, indicating he found the bug in Darwin’s collection. And the topmost ones – three yellowish, fading notes – contain Darwin’s own handwriting, a shaky cursive in dark black ink. Exactly how the beetle made its rounds from Darwin to Bernhauer remains unknown. According to Maier, it’s more rare to have a specimen collected by Darwin here in the states – the “On the Origin of Species” author was English, so museum-goers would be more apt to find his collections in London’s British Museum of Natural History. 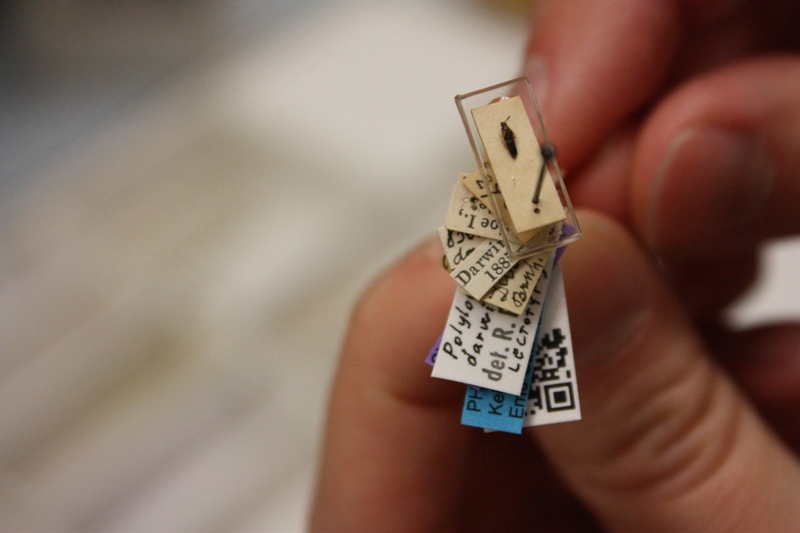 But curious Chicagoans will also be hard-pressed for a look at the Field’s Darwin beetle – like many of the museum’s specimens, this one exists for research purposes only. At first glance, the formaldehyde-soaked Evarra tlahuacensis doesn’t come off as a terribly striking fish. But the little minnow is actually the only remaining specimen of its kind on Earth – and it lives in Chicago.